Gone are the days, when golfers enjoyed the company of caddies, carrying your golf equipment is the new norm and rightly so. But carrying them on your shoulders might not be convenient. It may result in unnecessary fatigue, interfere with your focus on game and much more. Golf Cart Bags offer a worthy alternative for golfers with the advent of push golf carts. Cart bags are designed to sit on a cart that’s why they are large and relatively heavy and can house all your golf equipment & accessories. If you are planning to replace your old golf bag, with the best golf cart bag, this would be an apt read before you decide to pick one. Here are the top 5 cart golf bags that sell like hot cakes any day along with a detailed guide for choosing the right golf cart bag. 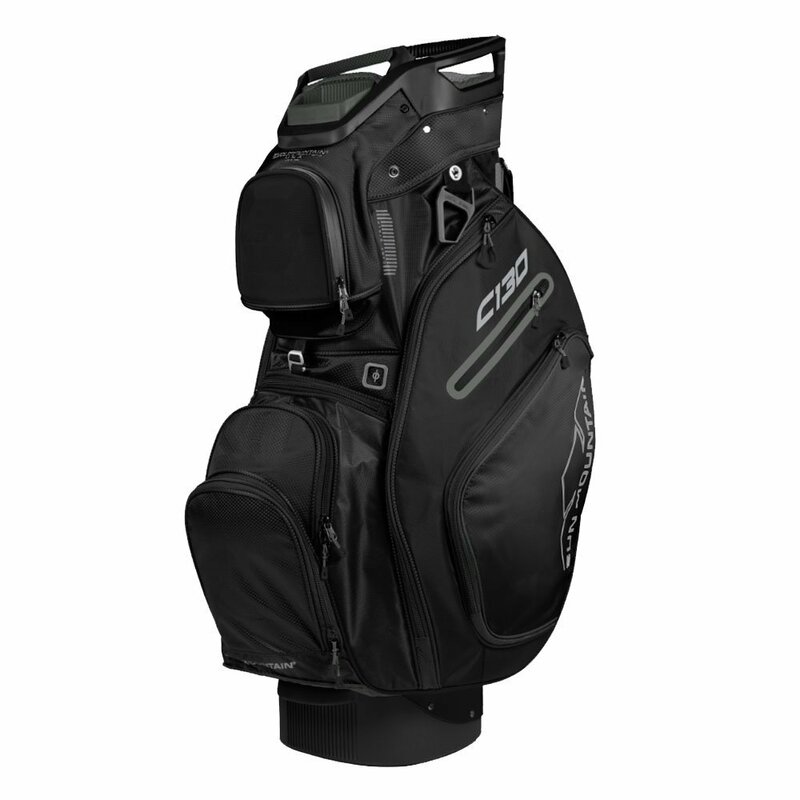 One of Golf Digest Editors’ Choice in the cart bag category, the C130 has got to be one of the top quality cart bags in the market. In fact, it has been leading Sun Mountain selling charts for a couple of years now. The 2018 version is even better with new features added. Some of the additions plugged into this cart bag come in the form of three velour-lined valuables pockets and a smart strap system that makes carting super easy. Carting has also been made easier thanks to 3 utility handles integrated to the bag to help you get it on and off a cart. Sun Mountain C130 has got to be one of the best golf cart bags and has been leading the Sun Mountain selling charts for a couple of years now. The 2019 version is even better with new features added. Three velour-lined valuables pockets and a smart strap system along with 3 utility handles integrated to the bag to help you get it on and off a cart. With 14 Full-length dividers to protect and organizes your golf clubs inside the bag and a putter well-this bag is crafted to protect shafts of your clubs while also keeping the clubs from damaging your putter’s head. The golf bag cart has got 10 pockets all designed to face forward in a way that allows access on the back of a cart. Among the ten pockets, there are 2 apparel pockets, a cooler pocket and three waterproof pockets which is nice for keeping some valuables secure even in bad weather. It isn’t a nice bag to carry for long without a cart but still, it has a single padded shoulder strap to make it comfy when moving it around. 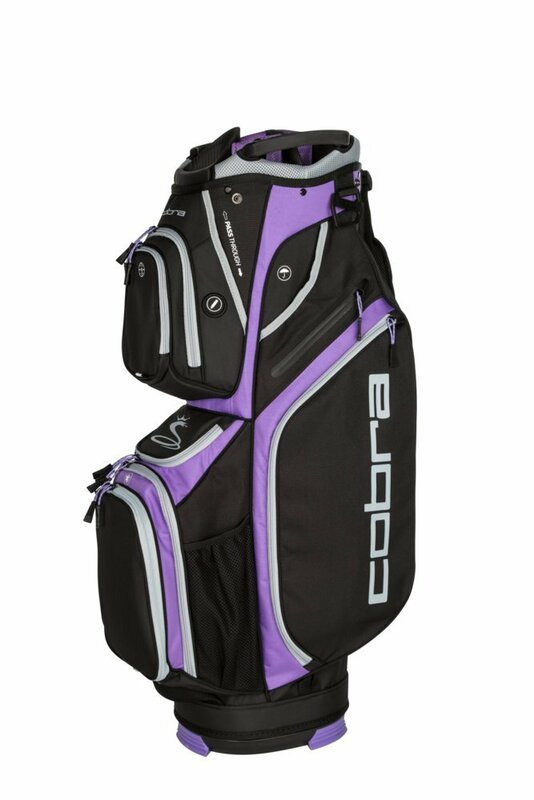 Cobra Golf 2018 Ultralight is another top draw cart bag you can buy. It is not only a stylish looking cart bag, but it is also one crafted for better functionality on the golf course. It has a 14-Way top with all full-length club dividers to help organize and protect your coveted golf clubs. In fact, the dividers are well lined to offer extra protection and reduce interference as the clubs sit in there. 12 Well designed pockets offer spacious storage options. Of these marvelous pocket options, there are dual size apparel pockets perfect for carrying something like a windbreaker or rain jacket in case the weather isn’t friendly. You will also get a cooler pocket which can hold a couple of 12 ounces cans. Moreover, there is a customizable ball pocket and fleece lined valuables pocket where you can secure important stuff as you play. It is a bag designed to keep you comfortable as you maneuver around. There is a cushioned shoulder strap, dual grab top grab handles, and a cart strap pass-through that ensures the bag is secure with an easy access to the pockets when you need them. Made of polyester thus it is lightweight and easy to clean. Taylor made have cut out a reputation in the world of golf clubs, golf stand bags, and accessories. The TaylorMade Golf Supreme cart bag is yet another product that exudes the stylish collection we have come to associate with this brand. To start with, this lightweight cart bag has got a couple of protection features designed to keep your clubs secure, including the putter. The features that make this happen are the 4 full-length dividers meant to organize and cushion the clubs in the bag plus a putter well fashioned to separate your clubs from the putter. 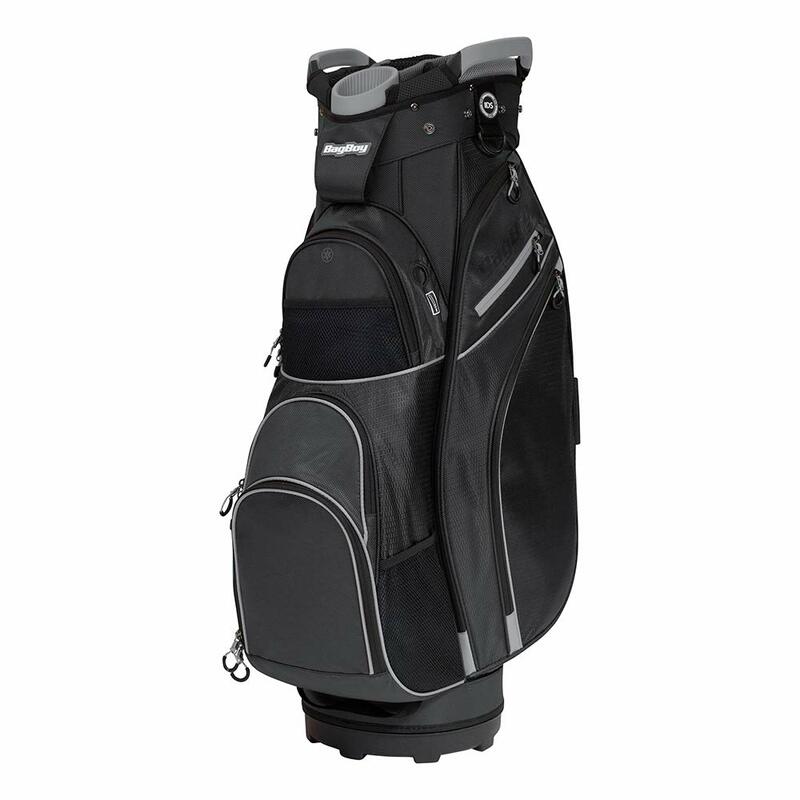 Other than keeping your clubs in this cart bag, you will also find tons of pockets that allow you storage of lots of other stuff you would like to tag along in your golfing expedition. There are 10 pockets to be precise but what’s cooler is that the pockets have been designed for different functionalities. For instance, the cart bag has got two micro-suede lined pockets where you can keep your valuables. It also has got a nice ball pocket where you can store a couple of extra balls. The bag also comes with a cooler pocket where you can move with a beverage or two during hot seasons. It goes without mention that this bag is built for anyone looking for smooth transit in a course. It has a push cart compatible base, single shoulder strap, top integrated grab handles among other design features tuned towards comfort. Bag Boy Golf Chiller is another one in the best golf bags for push carts league. Made of 420 Denier Nylon, this is a durable cart bag with lots of space and ergonomic features tailored for the avid golfer. The space aspect well illustrated by the 9 pockets in the bag’s design meant for ample storage. You pretty much have a pocket for what you may need in a golf course. If you would like to carry something like a sweater then there are two large apparel pockets you could use. This is just the tip of the iceberg though as you will get valuables pocket, accessories pocket, umbrella holder, ball pocket and chiller pocket with a removable insulated cooler bag. This pocket will definitely come in handy when you want an extra drink for a quick refreshment when playing. It is also great at keeping your clubs safe, organized and easy to access. This is owed to features like a 15-way organizer top with full-length individual dividers, a rubberized putter to separate your putter from other clubs etc. The cart bag has also been made easy to lift, carry and cart. One of the features in this domain is the soft-grip lift-assist handles to aid in giving you an easy lift. On top of that, the cart bag has a Top-Lok Technology which is basically a bag-to-cart attachment system for easier carting. Some users have complained about zipper problems especially the big zipper on the side of the cart bag. 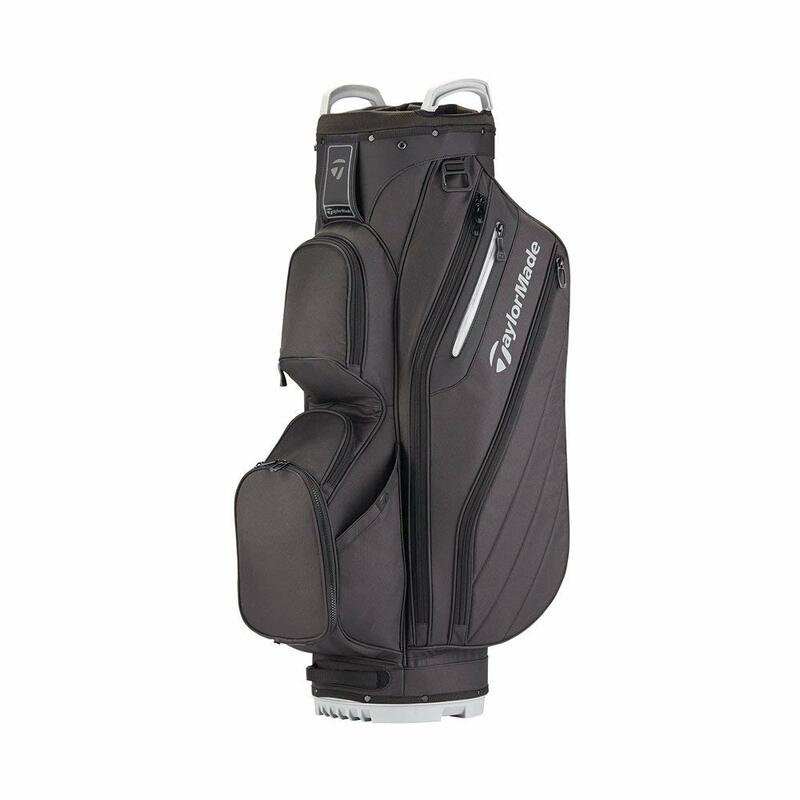 TaylorMade Cart Lite 2018 Golf Bag is designed for those looking for a lightweight cart bag with durable and functional features in mind. Just like most products from TaylorMade, the first thing that strikes the eye with this cart bag is the crush resistant construction that maximizes the life span of this bag. This is coupled with features like a Tarpaulin reinforcement cart strap tunnels that reduce wearing and tearing as you use the bag. 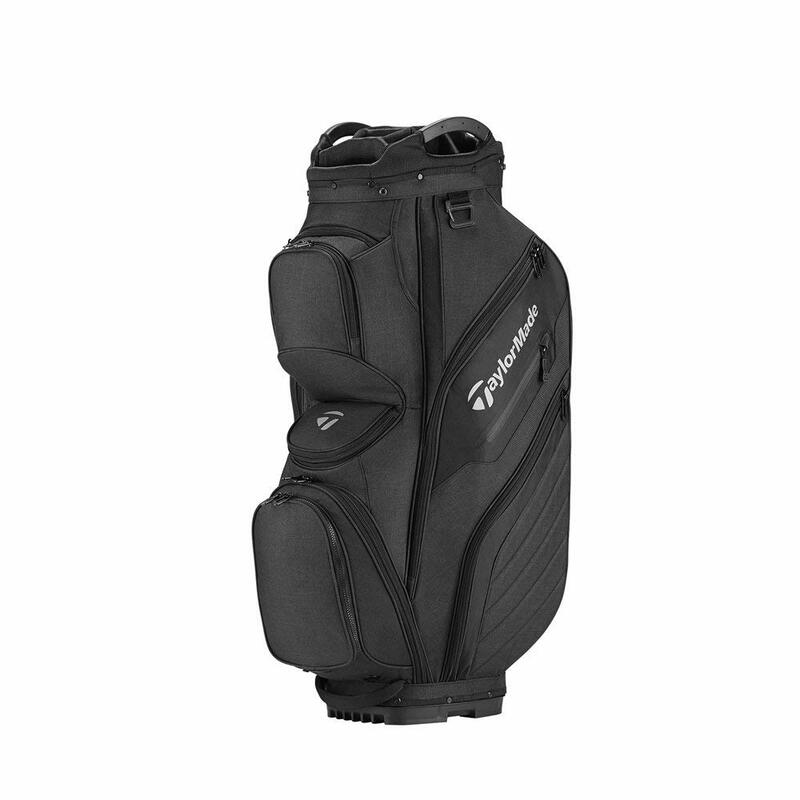 This cart bag has 14 full-length dividers that create space for every club whilst protecting them against other clubs. You will get 10 marvelous pockets in this cart bag where you can keep your valuables, balls, tees and much more. It has 2 micro-suede lined pockets perfect to protect any valuables you tag along in the course. Moreover, there are 2 full-length apparel pockets where you can keep any garments you want to carry around. The other pocket and space in this cart bag are a ball pocket, a tee pocket, a pen sleeve, an umbrella sleeve, and a towel loop. The Cart Lite golf bag is also crafted to be very easy to use. It has a comfy shoulder strap, a carry handle, a trunk handle and other features bespoke for an easy carry and carting. In fact, the top and the base of the cart bag are well optimized for push carts. It comes with a matching rain hood. It is a nice bag but the dividers in the cart bag aren’t the best you will find in the market. What You Need To Look For In Best Golf Cart Bag? Just like when buying any bag, storage has got to be the first thing that pops in mind. The same can be said of cart bags as you will need to find one that has the storage specs you need. By storage, we are talking about the likes of the pockets and other space add ons in the bag. Frankly, most cart bags in the market will tend to have lots of space thus you won’t really struggle to find a spacious cart bag. Remember, the more space you get the better as you will have more room to play around particularly if you are a traveling golfer. The other crucial aspect to look at when shopping for a cart bag is the protection capabilities of the bag. You should go for a golf bag that can help protect your clubs and any other valuables you want to tag along in your golfing experience. Every manufacturer claims to have the best divider system to organize and protect clubs but all of them aren’t the same. You will need to find the one with the divider system that suits your needs. Other than that, you may also go for a cart bag with a separate putter well for even better protection. Cart bags are supposed to be used with carts but still, you may want to keep the size and weight down. Buying a lightweight cart bag is a brilliant choice since you will still need to lift and load it to a cart from time to time. Try to go for a cart bag that is around 8 pounds or less but again, it depends on what suits you best. Of course, you don’t want to buy a golf trolley bag that only lasts for a few months then you have to go back to the market again. You are better off going for a bag that can keep you golfing well for at least a few years. The beauty with cart bags is that they aren’t designed to be carried on your back so you can afford to go for those with heavy and durable designs. It doesn’t have to be too heavy but perhaps a bag made of thick nylon, strong zippers, a waterproof membrane, and other durability oriented design features. At the end of the day, price matters the most when shopping for a cart bag. Cart bags are slightly expensive than the usual golf bags but you don’t have to spend too much for better quality. Don’t go on too low on or too high price but rather, find a bag with the design features you want at a price you can afford. Just like most other products on the market, it is vital that you check the warranty terms of a cart bag before taking it off the shelf. If you get a cart bag with a warranty period of 2 years then buy it! A warranty period of 1 year is also OK in giving you peace of mind once you have made the purchase. It isn’t uncommon to find cart bags that look good and work well for only a few months before falling apart. So, beware! You want the warranty option to return the cart bag if it doesn’t work as you expect within a year or so. That’s about it for our review featuring some of best golf bag for push carts in the market. It’s now your turn to pick the cart bag that suits you best. It is important to note that the bags we have reviewed are those that stand a cut above the rest but there are definitely other good options. In other words, there are other excellent golf cart bag brands you can look into on the market. In this regard, we hope that our simple best cart bag buying guide has helped you when shopping for the best golf cart bag for your needs.